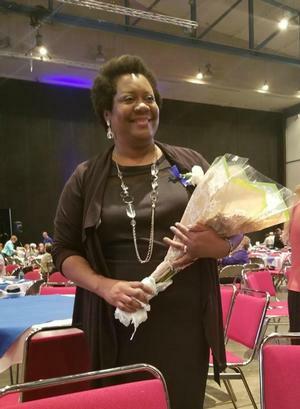 HAMPTON, Va. (November 14, 2018) – Danita Potter, Hampton University alumna, has recently been recognized at the 32nd Annual Great 100 Nurses Celebration of Louisiana as an Honoree for outstanding mentoring, caring, and commitment to nursing. Only exemplary nurses are selected based on their concern for humanity, their contributions to the profession of Nursing, and their mentoring of others. Currently, Potter is the program director of RN-BSN and professor at Northwestern State University of Louisiana. She oversees a 100% online non-traditional undergraduate program where her students are registered nurses and are pursuing a Bachelor of Science degree in nursing. She teaches nursing leadership and management, informatics and guides doctoral students pursuing their doctor of nursing practice. This year’s Great 100 Nurses Celebration took place on October 24, 2018 at the Pontchartrain Center in Kenner, Louisiana. Potter received her doctorate of nursing from Hampton University in May, 2011. She also holds a Bachelor of Science degree in nursing from Grambling State University and a Master of Science degree from Alcorn State University. Her experience at Hampton was a true life-changing experience. “I truly enjoyed my experiences at Hampton University, my ‘Home by the Sea.’ The PhD program is the best; it better prepared me for my role in higher education and beyond. The friends and family that I gained at Hampton; we are still family. We continue to support each other in scholarly activities around the world. All of the faculty and staff in the school of nursing guided us to do our very best and for them I am grateful to have earned my PhD at HU,” Potter said. The Great 100 Nurses Foundation was founded by PK Scheerle, RN in New Orleans, Louisiana in 1986. Since its founding, the Great 100 Celebrations have honored thousands of Nurses across Louisiana, North Carolina, Texas, Oklahoma and Arkansas. Each year, community, health care, government leaders, family, friends and peers join together to honor these Great 100 Nurses. The funds raised through each Celebration are used to honor the nurses at the event and to support nursing advocacy, nursing scholarships, and nursing research for the betterment of lives.